John Patrick is a gambler and casino expert who believes he had discovered 4 main ingredients to take a successful and lucky gambler; his games of choice were always poker and craps but he always examined all casino games in general and deserved the right to be among baccarat gurus: he is the author of 15 gambling books and the host of cable TV show SO YOU WANNA BE A GAMBLER. 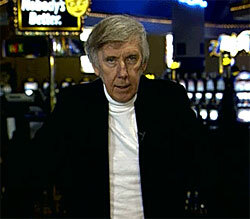 What else can be said about this notorious personality of gambling world? Read below. Today, Mr. Patrick is a very significant figure in the world of gambling: he has been hosting his own TV show for 10 years already, writes and publishes books, plays in various movies, leads seminars and takes part in many TV and radio shows as an invited guest. John Patrick also has over 30 videos where he explains all important aspects of gambling a player should know in order not to lose all his/her money at once: Mr. Patrick is sure that discipline is the key to success, and he believes that only two types of casino gamblers exist - Experts and Dopes. John thinks that only experts have the right to play in casinos because if you are not an expert you will definitely lose your money because of gambling. John Patrick believes that because of his personal experience: he also came to casinos before and lost a lot of money; after that he developed his own rules of Money Management and always believed that it was better to win a bit than to lose a lot. He knows what he says because he experienced big losses and did not like that feeling of a loss at all. According to John Patrick, the first two components are very important for every gambler, but the last two ones are more than just significant - they are imperative ones! The whole list of John Patrick's achievements for the world of casino and gambling, and baccarat in particular, you will find here.